Currently, all content downloaded from Netflix has an expiration date. After a certain amount of time, you have to "refresh" the download. Caching a video always counts as a download whether you're downloading on a new device or just refreshing an existing download. 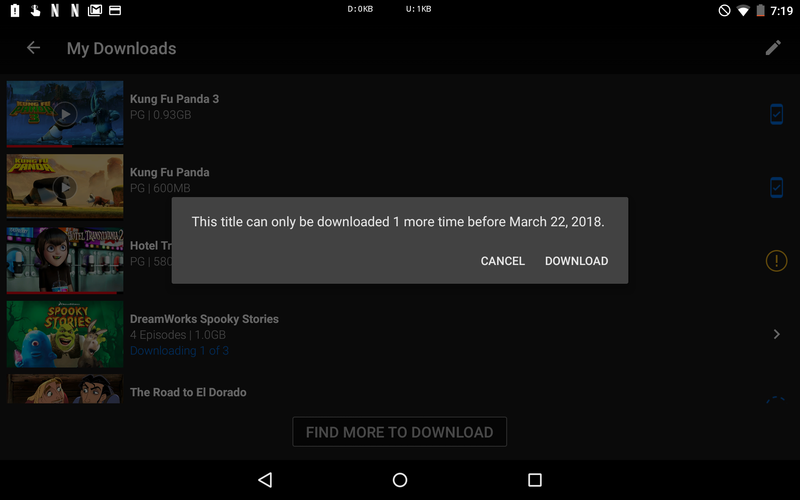 After a few downloads, some episodes and movies will pop up a warning that explains you can only download them one more time before a particular date (probably a year from the first download). We're not sure what the limit is, but it probably varies based on the content owner's rules. It's not a large number—maybe four or five total downloads in a year. If you try to download again after that, you get an "10016-22006" error that informs you that you've reached your download limit. The existence of the download cap isn't really Netflix's fault. After all, it doesn't own most of the content it offers, and rights holders can demand these rules. However, the way Netflix hides this limit is incredibly dumb. You can't tell if there's a limit on downloads, so you may cache something offline "just in case" and use up all your downloads. So, I guess the bottom line right now is be careful what you download, and watch what you download.